Places in the semi-finals of the Women’s Singles event at the Lion 31st ITTF-ATTU Asian Cup Yokohama 2018 at stake, in the round of the last eight contests on Saturday 7th April, it was the higher seeded players who prevailed. China’s Chen Meng and Zhu Yuling, alongside Japan’s Kasumi Ishikawa, the top three names all emerged successful as did Chinese Taipei’s Cheng I-Ching, the no.5 seed. Chen Meng reserved her place courtesy of success against Chen Szu-Yu, the no.7 seed, who most certainly offered spirited resistance. She extended the top seed to six games (11-8, 10-12, 11-2, 11-6, 9-11, 11-3), a performance that exceeded her efforts of the previous day. In the group stage she had finished in third place behind Kasumi Ishikawa and Korea’s Suh Hyowon. Thus she had been required to compete in the challenge round earlier in the day. Most impressively, she overcame India’s Ayhika Mukherjee (11-13, 11-9, 11-8, 11-4) to reserve her last eight place. 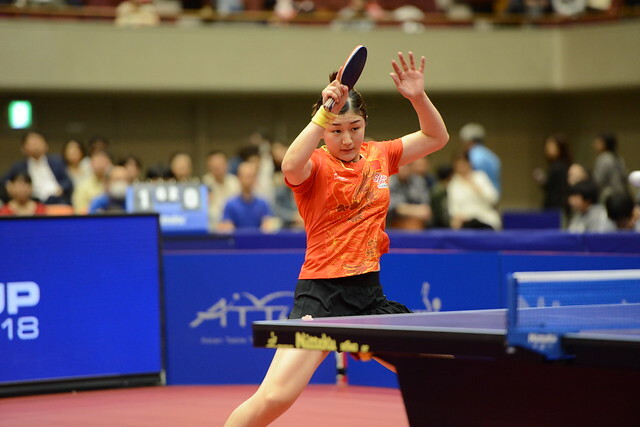 A six games win for Chen Meng, it was the same for Cheng I-Ching and for Zhu Yuling. Eventually, Cheng I-Ching overcame the defensive skills of Korea’s Suh Hyowon, the no.6 seed (11-6, 11-13, 11-5, 10-12, 11-9, 11-5); Zhu Yuling accounted for the host nation’s Miu Hirano, the no.4 seed (11-4, 11-13, 11-5, 10-12, 11-9, 11-5). Notably it was the second time in the tournament that Zhu Yuling and Miu Hirano had met; the previous day in the group stage, Zhu Yuling had beaten Miu Hirano in straight games (11-9, 11-6, 11-6). In addition Miu Hirano had lost to Hong Kong’s Doo Hoi Kem (6-11, 11-8, 9-11, 12-10, 13-11) and had finished in third place in her group. Therefore, in order to gain her quarter-final place she was required to compete in the challenge round. She duly responded to beat Thailand’s Suthasini Sawettabut, the no.11 seed, in straight games (12-10, 11-7, 11-5). Hard fought contests, the one remaining quarter-final encounter was less exacting; Kasumi Ishikawa, the no.3 seed, accounted for Doo Hoi Kem in four straight games (11-6, 13-11, 11-7, 11-4). In the penultimate round Chen Meng plays Kasumi Ishikawa, Cheng I-Ching opposes Zhu Yuling; the matches will be played later in the day.